What is New in the latest version of the APK Editor Pro APK app? If you are someone who loves coding and creating apps, APK Editor Pro is the best you can get. The application has been receiving constant updates and has been quite popular with software freaks. We present information on what is new in this great piece of software – the APK Editor Pro. APK Editor Pro – What it is? APK Editor Pro is one of the best options you can use to edit and hack your APK files with ease. Apart from the productivity improvements, it can also be your best bet for fun with codes – well, if you are someone who loves coding. A word of caution here – you will need to have a little to moderate expertise in professional skills in coding or related information. Do not panic if you do not have that much knowledge – there is always a help section you can turn to. And the help section on APK Editor Pro APK is excellent enough to guide even those who are not much proficient with coding and related information. Replacement of background image on the apps. Re Architecturing of of layouts. The Pro version does support for editing Smali codes. You can edit the app data with ease. This can be the best way to customize the app to suit what you want from it. You can patch the app with additional functionality. And most importantly, the tool is completely ad free if you opt for the Pro version. 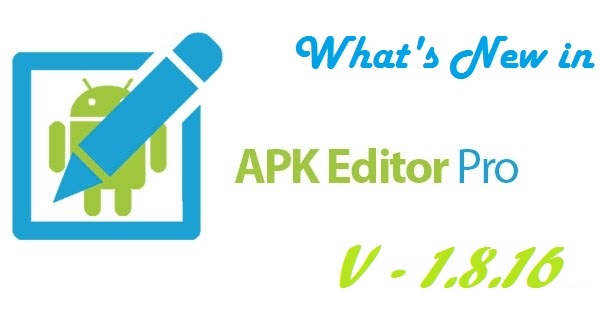 What is new in the latest version of APK Editor Pro APK? A new rule for patching has been introduced – MATCH_ASSIGN. The version includes bug fixes for some of the issues reported in the previous versions. New icons for the UI. The project issue observed in the previous version has been fixed in the latest version. Incidentally, the latest version available on the Google App Store is 1. 8.13. Is it easy to use the App? Well, it should be a relative term to say it is easy. Why? Because you may need to have a few technical skills. However, it does come with a few simple operations that can be worked out with the help of an easy to understand tutorial. As an example, you can open the app apk within the APK Editor Pro. You can access the app either from a folder or from the installed apps. Once you open the apk, the APK Editor will show you the editable options. Just make the changes and save the file. That does it. Do install the APK Editor Pro APK on your phone and do let us know what you feel about it or its usefulness.